Stay cool! Very excited it's Friday again! I agree a 5 day work week is nuts! I had he change to work M-Th every week and I ran with it! Love the ring! Happy weekend! I've been wanting to try that eyebrow pencil, but my drugstore one from L'Oeal seems to be getting the job done okay... do you think it's worth a high end makeup price? Benefit's packaging is just too darn cute to pass up sometimes, but I'm on a tight budget this summer! It was 109 the other day here...and SO humid! I don't think I stepped foot outside that day, it was miserable! Love those booties, they are the perfect transition to fall and I must try that brow pencil! Hope you have a great weekend! i am loving the color palette here! so cute and neutral. fav :) that ring NEEDS to be in your life. it's so perfect to add to the collection! and i think i need that t-shirt in my life haha. i am a t-shirt hoarder. and love the detail. ugh this weather. i'm ready for fall! :) happy friday love! Loving all of these picks! That wood/marble cutting board is seriously the cutest AND I actually just put that tee in my shopping cart! I think it's such a fun twist on your basic tee! It is really so hot! And the humidity in NC is just horrible. But no true complaints because I love summer! Loving that cutting board and those shoes! Stay cool this weekend! That is crazy!! I am all about marble everything, so I want that cutting board! Have a great (and cool) weekend. We were just discussing getting a new cutting board because ours has had it - think this one looks perfect! I just ordered a new brow product but I think I'll be buying this benefit one, too! Have a great weekend! I love that cutting board, so chic and classy! I bought that brow pencil and am loving ittttt, it works so well-right!!? 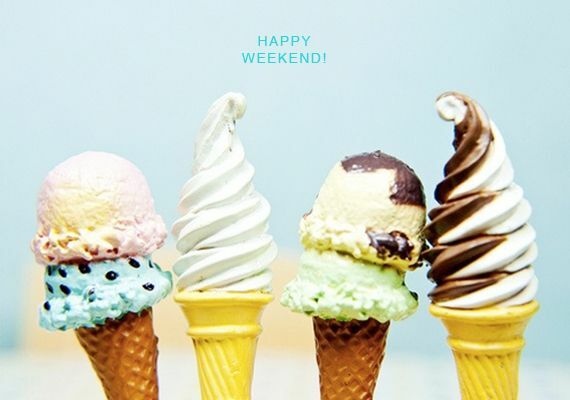 Stay cool and enjoy your weekend girl! I absolutely love that mermaid ring!! Definitely going to have to check that out for myself too. Have a great weekend! The marble and wood cutting boards are fabulous. We sell them where I work and people love them! I am dreaming of Fall clothes and those booties are amazing!! AND that cutting board... YES! Perfect for a cheese tray! That mermaid ring is SO perfect for you!! What a fun find! Enjoy your weekend! Love that cutting board - perfect for everything! This heat is seriously such a killer! I'm thinking that I'll be spending most of my days inside too! We have a similar marble and wood cutting board from Sur La Table and we love it! It's so pretty and makes us feel that much more fancy on charcuterie night! I hope you have a great weekend! That mermaid ring!! So cute! Have a great weekend!!! Your ice cream is reminding me how much I love ice cream! Love that mermaid ring, super cute! I'll take one of each of those ice cream cones as it is hot, hot, hot!! I have a wood/marble board and absolutely love it, you can't go wrong! Stylish shirt and yummy ice cream. If only every week was 4 days-- especially in the summer (and fall...and spring? haha). Love that top!